Ratatouille used to be peasant food and was a way for old housewives to cook and use old vegetables that are ready to be thrown away. This Ratatouille recipe is perfect for vegetarians and one serving counts towards 3/4 of your 5 a day. The word, “ratatouille” comes from the French, “touiller” – to stir. Ratatouille is also one of our favourite films, which we highly recommend. 1. Score a cross in the base of each tomato and place into a heat proof bowl then cover with boiling water for around 1 minute, drain then set aside until the tomatoes are cool to handle. 2. While waiting for tomatoes to cool down, cut the aubergines into quarters, lengthways and cut those quarters further into smaller bite size chunks (around 2.5 cm). 3. De-seed the peppers and cut them into bite sized pieces. 4. Take the cooled down tomatoes and peel the skins away, then cut them into quarters. 5. Pre-heat oil in a cooking pan, chop the onions and cook them on a low simmer, covered, until they have softened and browned. 6. Add the aubergines and courgettes and cook on a high heat for 3 minutes. 7. Stir in the peppers, sugar, thyme, rosemary, bay leaves, half of the bunch of fresh basil, salt and pepper and mix it well. 8. Cover pan and cook over a low heat for around 20 minutes. 9. Stir in the tomatoes and chopped garlic to the pan and cook for a further 10 minutes on a low heat, covered. 10. Remove the pan from the heat and stir in the remaining basil and serve. 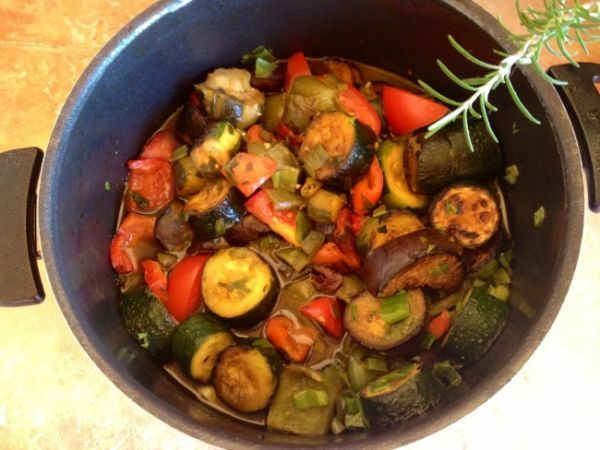 Ratatouille can be served by itself or with rice and/or chicken (for added protein). I had no idea ratatouille started as peasant food – and I eat it all the time! Never made it myself though. I’ll have to save this recipe! Thanks for the récipé. We often roast the peppers and aubergines with olive oil and herbes de Provence to concentrate the flavour and reduce water content but do not see any advantage in skinning tomatoes, which anyway takes time!